It’s easy to overlook plants that do not offer flashy flowers or exciting seed heads or berries and tend to look similar from one month to another. These plants however are often the workhorses in the garden providing a subtle backdrop to their flasher bedmates. One such plant is Arenaria ‘Wallowa Mountains’. 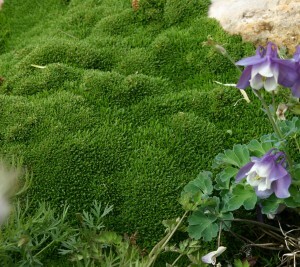 Championed by Plant Select Petites for 2015 as “desert moss’ this cushion forming alpine plant from Oregon’s famed Wallow Mountains is essential in every rock garden, trough, crevice garden or anywhere a mound of bright green is needed. Greening in spring with warming temperatures and staying green until bitter cold temperatures turn the older leaves a golden brown ( in full sun the whole plant can turn golden for the winter). It seems to be brightest in spring and fall. By fall its slowly expanding undulating bun of green can be the center of attention in the rock garden. Small white flowers appear sporadically in summer; however the plant is grown more for its evergreen foliage. For such an adaptable plant a bit of mystery surrounds the origin of Arenaria ‘Wallowa Mountains’. Most people report that, Boyd Kline of Siskiyou Rare Plant Nursery introduced the Arenaria through the Siskiyou Rare Plant Nursery Catalog, at first as a very dense form of Silene acaulis collected in the high Wallowa Mountains, later when it did produce a few sparse flowers, it was determined it was not a Silene but an Arenaria (sandwort). The trail seems to go dead there as no one I have contacted seems to know exactly where Boyd collected the plant and the online Flora of Oregon seems to have no record of the plant. Perhaps Arenaria ‘Wallowa Mountains’ represents an un-described species from Oregon? Regardless of the mystery which seems to surround this superb plant it deserves a spot in your garden. Site desert moss in full sun or part shade, in moderate to sandy soil. As for watering, it grows under moderate to dry conditions. It will grow well as a groundcover or topdressing in containers, including miniature or fairy gardens, where it can serve as a fairy lawn. It can be grown between pavers, on a path or among other xeric plants. Desert moss survives air temperatures in USDA Zones 4–8, but it will not do well in areas that are Zone 7 and 8 and have high humidity. Thanks to Mike Kintgen, Curator of Alpine Collections, Denver Botanic Gardens, for this piece. Hello I am looking for arenaria wallowa mountains moss. Could you please inform me when the item will be available for purchase? I believe that it was readily available this spring in Colorado Front Range independent garden centers, but this late in the season it’d be best to call around. I know that Tagawa Gardens in Centennial oftens orders a large amount of fresh stock for early fall planting – definitely worth a call to them. High Country Gardens in Colorado and seeds on Amzon. Pricy! It’s a VERY slow grower, so I imagine the price would be justified from that perspective. As far as seed goes, I don’t think you’d be able to find this particular species – it rarely flowers, much less sets seed. ALl our licensed growers produce it from cuttings and divisions. Arkansas. Zone 8. And like most southern states, we have humidity, but it doesn’t get soupy thick here. Is humidity definitely not going to work for this moss? I’d love to plant a mound top with it, but will it simply die because of our humidity, or have I a chance? I think this arenaria will work if you plant it in a very sandy soil. The top won’t mind the humidity, but the roots won’t want to be wet for long periods of time. Could I grow this in the UK?